Home Blog What Are the Types of Italian Media? What Are the Types of Italian Media? Before you begin working your way to foreign language fluency, it helps to understand the culture behind the language you’re learning. After all, language exists to help a group of people express their ideas and beliefs. Italy is an old country with a rich history and culture. As you begin your Italian language program, gaining a strong grasp on this history, the values, and the etiquette will help you rapidly achieve success. In particular, Italians have access to a variety of media to stay current on world affairs even though there is some controversy regarding state control. Television programming in Italy is vastly different from what Americans and the British would expect. As it works on the PAL system, it’s incompatible with non-European programming. On the upside, Italian TV went digital seven years ago, so now there is a wide selection of free to air television channels. Visitors may not find much to watch, however, because nearly all of the programming is in the Italian language. There may be English language programming in some larger cities, but even that may be difficult to find. While the state operates their RAI radio and television network, it’s not quite as popular as the privately owned Mediaset, which mainly consists of Rete 4, Canale 5, and Italia 1. This offering is owned and provided by former Prime Minister, Silvio Berlusconi. If you live in Italy, you’re required to pay a special television and radio tax, called “Canone Rai.” The license tax is mandatory, even for citizens who don’t access the local broadcasts. For residents of a furnished flat equipped with a television, that tax is still mandatory. The forms for paying the tax were available at any Italian Post Office(though you will still need your own tax code to apply) until 2016, when the tax was added in the electric bill. For the radio, Italian and international music can be found on Radio Italia, Radio Globo, or Radio DJ,just to name few of the popular radio stations. English radio and television is provided through BBC World Service, which offers programming in English and 27 other languages. The corporation also operates a subscription service, BBC World TV. The major networks, such as ABC, CNN, and NBC, may also be available, depending on the service area. Italian satellite television also provides programming from BBC 1,2, 3, and 4, as well as Radio Canada, Radio Australia, and Voice of America. Newspaper reading is far less popular in Italy than it is in the United States or in the U.K. Among the Italian people, newspaper circulation is significantly less in the southern part of the country. Even so, visitors to Italy should be aware of the different newspapers and their readerships, particularly if they want to keep up with current events during their stay. For instance, most newspapers are distributed regionally, though there are some newspapers that do cover a national readership. Regardless, all of the country’s newspapers are politically charged with a particular slant, so visitors should be prepared for that as well. The country’s widest-selling newspapers are Repubblica, which is published out of Rome and maintains center left views, and Corriere della Sera, the center right newspaper out of Milan. Corriere della Sera may be the preferred option, as it includes an English language section. Italy offered a communist publication, L’Unità, until June 2017 when it closed. 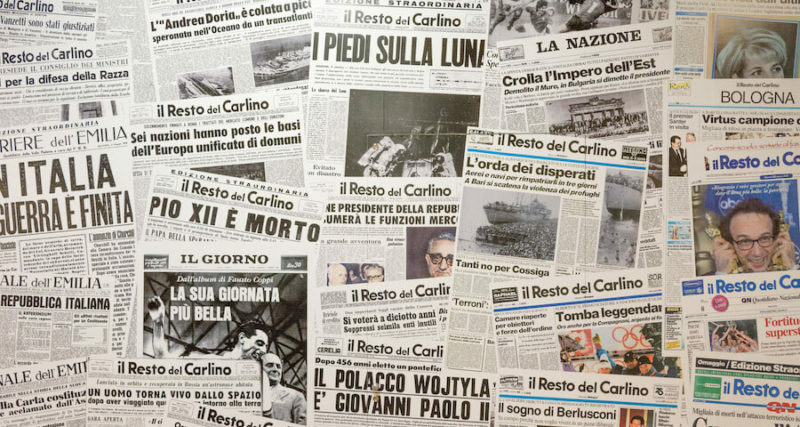 The most important regional newspapers throughout Italy are La Nazione in Florence, La Stampain Turin, Il Tempo and Il Messaggero, which are both out of Rome, Il Secolo XIX in Genoa, and La Siciliain Catania. L’Espresso is Italy’s primary news magazine, though there are other less popular periodicals that can be found in each region. You won’t find tabloids available throughout Italy the way they are in the US and UK. Instead, there are two very widely distributed sports periodicals, Corriere dello Sport and La Gazzetta dello Sport. Celebrity gossip and paparazzi photos can be found in Oggi and Gente. Additionally, there are several English language magazines distributed throughout Italy, which are geared towards visitors of the country. The most popular ones are Time Out Rome, Where Rome, and A Guest in Milan, all of which are released on a monthly basis. These magazines are usually available at most hotels, though they sell out by the afternoon. It’s best to be up early and pick up your desired periodicals before the morning working crowd claims everything. Standard newsstands, such as those seen in western countries, aren’t popular in Italy. Instead, kiosks (“edicole”) can be found throughout each city. In addition to newspapers and magazines, the kiosks also provide CD-ROMs and videos on a number of different topics. The kiosks are where Italians get most of their news and content, just as Americans stop at their local newsstands on their way to work. Finally, a selection of international publications can be obtained in Italy. The most popular offerings are The New York Times International Edition and The Economist, which is a weekly news magazine. Both periodicals are widely read and can be purchased at any kiosk in Italy. Only the British and Portuguese beat out Italy on television watching in Europe. When Italians aren’t working, they watch an average of 4 hours per day and most Italians reported watching at least some television every day. While cable television is extremely limited, Astra satellite service imports programming from around the world and dubs it into the Italian language. Italians make strict policies on when and how violence can be shown. Neither violence nor sexually explicit programming can be aired between 7:00 a.m. and 10:30 p.m. Prior to 1976, all programming was run by the state and censored by the church. Today, however, there are six national stations, supplemented by hundreds of regional networks. Rai 1, Rai 2, and Rai 3 are state run stations, while Silvio Berlusconi’s Italia 1, Rete 4, and Canale 5 are the primary commercial stations. Viewership is divided almost in half between the commercial stations and the state-run stations, with a remaining 10% viewing local programming. The fact that Italy values its television so highly and yet has its programming monopolized between the state and a former prime minister is a major source of many complaints. This is an even bigger complaint than the lack of quality in the programs that are aired. What Is the Proper German Business Etiquette?